A year after the war in Iraq, discontent with America and its policies has intensified rather than diminished. Opinion of the United States in France and Germany is at least as negative now as at the war’s conclusion, and British views are decidedly more critical. Perceptions of American unilateralism remain widespread in European and Muslim nations, and the war in Iraq has undermined America’s credibility abroad. Doubts about the motives behind the U.S.-led war on terrorism abound, and a growing percentage of Europeans want foreign policy and security arrangements independent from the United States. Across Europe, there is considerable support for the European Union to become as powerful as the United States. In the predominantly Muslim countries surveyed, anger toward the United States remains pervasive, although the level of hatred has eased somewhat and support for the war on terrorism has inched up. Osama bin Laden, however, is viewed favorably by large percentages in Pakistan (65%), Jordan (55%) and Morocco (45%). Even in Turkey, where bin Laden is highly unpopular, as many as 31% say that suicide attacks against Americans and other Westerners in Iraq are justifiable. 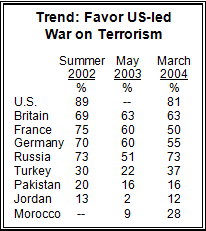 Majorities in all four Muslim nations surveyed doubt the sincerity of the war on terrorism. Instead, most say it is an effort to control Mideast oil and to dominate the world. There has been little change in opinion about the war in Iraq — except in Great Britain, where support for the decision to go to war has plummeted from 61% last May to 43% in the current survey. In contrast, 60% of Americans continue to back the war. Among the coalition of the “unwilling,” large majorities in Germany, France and Russia still believe their countries made the right decision in not taking part in the war. Moreover, there is broad agreement in nearly all of the countries surveyed — the U.S. being a notable exception — that the war in Iraq hurt, rather than helped, the war on terrorism. In the four predominantly Muslim countries surveyed, opposition to the war remains nearly universal. Moreover, while large majorities in Western European countries opposed to the war say Saddam Hussein’s ouster will improve the lot of the Iraqi people, those in Muslim countries are less confident. In Jordan, no less than 70% of survey respondents think the Iraqis will be worse off with Hussein gone. This is the latest in a series of international surveys by the Pew Global Attitudes Project. It was conducted from late February to early March in the United States and eight other countries, with fieldwork under the direction of Princeton Survey Research Associates International.1 The survey finds a significant point of agreement in opinion on Iraq’s future. Overwhelming majorities in all countries surveyed say it will take longer than a year to establish a stable government in Iraq. But there are deep differences about whether the U.S. or the United Nations would do the best job of helping Iraqis to form such a government. The U.N. is the clear choice of people in Western Europe and Turkey; Americans are divided over this issue. However, roughly half of Jordanians and a third of Moroccans volunteered that neither the U.S. nor the U.N could do best in this regard. Americans have a far different view of the war’s impact — on the war on terrorism and the global standing of the U.S. — than do people in the other surveyed countries. Generally, Americans think the war helped in the fight against terrorism, illustrated the power of the U.S. military, and revealed America to be trustworthy and supportive of democracy around the world. These notions are not shared elsewhere. Majorities in Germany, Turkey and France — and half of the British and Russians — believe the conflict in Iraq undermined the war on terrorism. At least half the respondents in the eight other countries view the U.S. as less trustworthy as a consequence of the war. For the most part, even U.S. military prowess is not seen in a better light as a result of the war in Iraq. A growing number in Western Europe also think that the United States is overreacting to the threat of terrorism. Only in Great Britain and Russia do large majorities believe that the U.S. is right to be so concerned about terrorism. Many people in France (57%) and Germany (49%) have come to agree with the widespread view in the Muslim countries surveyed that the America is exaggerating the terrorist threat. Nevertheless, support for the U.S.-led war on terrorism has increased dramatically among Russians, despite their generally critical opinion of U.S. policies. More than seven-in-ten Russians (73%) currently back the war on terrorism, up from 51% last May. Since the end of the Iraq war, there also have been gains in support for the U.S. anti-terrorism campaign in Turkey (from 22% to 37%) and Morocco (9% to 28%). On the other hand, backing for the war against terrorism has again slipped in France and Germany; only about half of the public in each country favors the U.S.-led effort. Publics in the surveyed countries other than the United States express considerable skepticism of America’s motives in its global struggle against terrorism. Solid majorities in France and Germany believe the U.S. is conducting the war on terrorism in order to control Mideast oil and dominate the world. People in Muslim nations who doubt the sincerity of American anti-terror efforts see a wider range of ulterior motives, including helping Israel and targeting unfriendly Muslim governments and groups. Large majorities in almost every country surveyed think that American and British leaders lied when they claimed, prior to the Iraq war, that Saddam Hussein’s regime had weapons of mass destruction. On balance, people in the United States and Great Britain disagree. Still, about three-in-ten in the U.S. (31%) and four-in-ten in Great Britain (41%) say leaders of the two countries lied to provide a rationale for the war. In that regard, opinions of both President Bush and British Prime Minister Tony Blair are negative. Large majorities in every country, except for the U.S., hold an unfavorable opinion of Bush. Blair is rated favorably only by a narrow majority in Great Britain but fully three-quarters of Americans. In contrast, U.N. Secretary-General Kofi Annan is viewed positively in nearly all nine countries surveyed, with Jordan and Morocco as prominent exceptions. The United Nations itself engenders varied reactions around the world. Just 55% of Americans have a favorable opinion of the world body. This is the lowest rating the U.N. has achieved in 14 years of Pew Research Center surveys. People in Russia and the Western European countries have a considerably more favorable view of the U.N. But large majorities in Jordan and Morocco hold negative views of both the U.N. and the man who leads it. Majorities in the Western European countries surveyed believe their own government should obtain U.N. approval before dealing with an international threat. That idea is much more problematic for Americans, and on this issue Russians and people in Muslim countries are much closer to Americans than they are to Western Europeans. Despite that small piece of common ground, however, there is still considerable hostility toward the U.S. in the Muslim countries surveyed. Substantial numbers in each of these countries has a negative view of the U.S. Overwhelming majorities in Jordan and Morocco believe suicide attacks against Americans and other Westerners in Iraq are justifiable. As a point of comparison, slightly more people in those two countries say the same about Palestinian suicide attacks against Israelis. About half of Pakistanis also say suicide attacks on Americans in Iraq — and against Israelis in the Palestinian conflict — are justifiable. Fewer respondents in Turkey agree, but slightly more Turks view suicide attacks on Americans in Iraq as justifiable as say the same about Palestinian attacks on Israelis (31% vs. 24%). Despite concerns about rising anti-Semitism in Europe, there are no indications that anti-Jewish sentiment has increased over the past decade. Favorable ratings of Jews are actually higher now in France, Germany and Russia than they were in 1991. Nonetheless, Jews are better liked in the U.S. than in Germany and Russia. As is the case with Americans, Europeans hold much more negative views of Muslims than of Jews. The survey finds, however, that Christians get much lower ratings in predominantly Muslim countries than do Muslims in mostly Christian countries. Majorities in Morocco (73%), Pakistan (62%) and Turkey (52%) express negative views of Christians. The adage that people in other nations may dislike America, but nonetheless want to move there is borne out in Russia, Turkey and Morocco. Roughly half of the respondents in those three countries say people who have moved to the U.S. have a better life. But one of the largest gaps between Americans and Europeans concerns the question of whether people who move to the U.S. have a better life. Americans overwhelmingly believe this to be the case — 88% say people who move to the U.S. from other countries have a better life. By contrast, just 14% of Germans, 24% of French and 41% of British think that people who have moved to the U.S. from their countries have a better life.